On a recent field trip to collect house centipedes (Scutigeridae) for the filming project we are working on, I found a large specimen but not quite in the way I expected. This one had just been caught by a Brown Huntsman (Heteropoda sp.) and probably wasn't going to be much use to us on set! 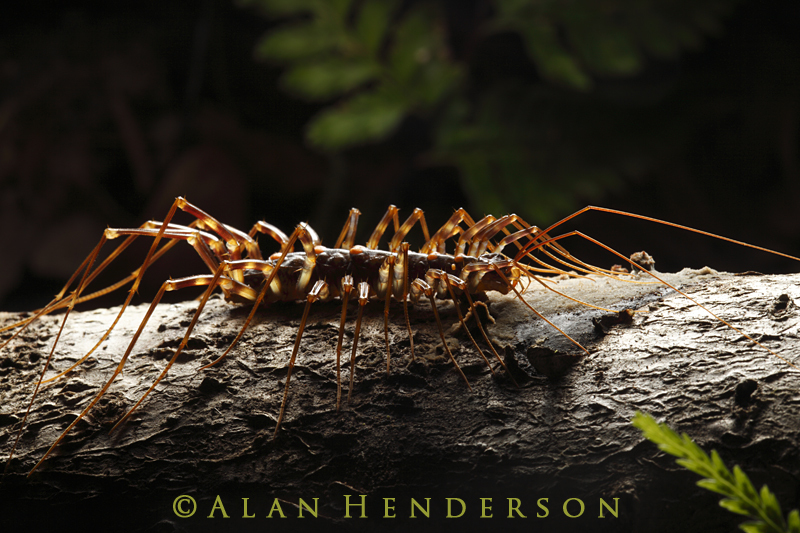 These centipedes have 15 pairs of long thin legs, and needless to say they move very fast. As quick as huntsman are, it is still surprising that it managed to catch such a sensitive and rapid moving animal. House centipedes have two large compound eyes contrasting with other groups of centipedes which have smaller simple eyes. They are predatory and venomous, injecting their venom through short modified legs which act as fangs. These 'venom claws' are located just below the mouths of house centipedes. The name 'house centipede' originated overseas due to some species occurring inside houses. Ironically most species of house centipedes never come inside. The Brown Huntsman (Heteropoda sp.) 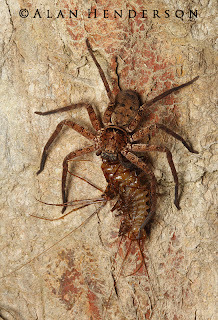 feeding on the house centipede. A specimen we found a couple of nights later at the same site. This species can attain a body length of almost 60mm with a leg span of over 100mm. Only two particular species as far as I can tell are true "House centipedes", ie are commonly encountered in houses. The rest aren't really called by that common name - at least from the information available online.